Your engagement rate on Instagram is one of the most important factors in determining whether or not an audience will convert into sales. What is an engagement rate? How do you measure your engagement rate? Let's explore how to go beyond your following and into how influential your brand or account actually is. Instagram Engagement refers to how interactive one's audience is on the application, Instagram. Their degree of social involvement is defined by a "Like", "Comment" or "Tag" on a post. For example, when you see a cute photo of a sleeping kitten and tap the heart button to like it, you are already engaging. When you leave a complimenting comment on that 9-5 OOTD that a fashionista posted on her feed, then you are already engaging. 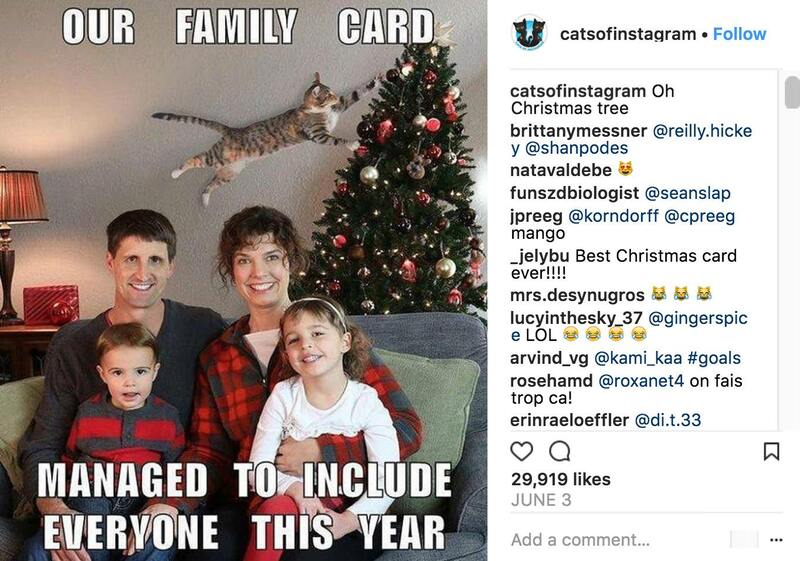 Below on the very popular Cats Of Instagram page, you'll see the 29,919 likes and various comments - these are engagements. But there’s more to it than just comments or likes. Response-based engagement through comments, Direct Messages (DMs), Instagram Story poll answers. Reaction-based engagement through captions that captivate the interests of your followers. Action-based engagement through a positive response to Calls to Action (CTA), visiting of links posted. Follower-based engagement through following accounts and gaining followers. Sharing-based engagement through the use of hashtags, user tags, and location tags. Rewards-based engagement through Instagram promotions and campaigns. Now, that’s a lot of engagement that you can absolutely take part of! With the recent introduction of different features on Instagram such as Instagram Stories, engaging with different users and accounts increase your ability to gain traction. The more engaging your account, the more the most recent Instagram algorithm will favour you, so make sure your profile is worth interacting with! Huda Beauty has one of the most engaging Instagram profiles in the beauty industry with a whopping 23 million followers. 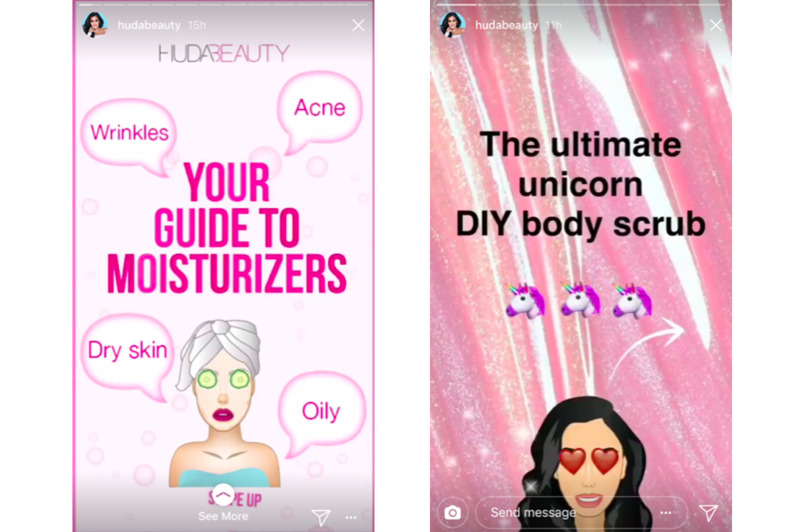 Huda creates engaging Instagram Stories which link her followers to website content, product recommendations and her own line of beauty products. Instagram engagement covers everything that allows you connect with your target users, interact with them by maximizing the social media platform’s features, and widen your follower count or audience. For those who are still starting to find their way through the world of Instagram marketing, the term “Instagram Engagement” may sound foreign or even daunting. When the app was first launched in 2010, calculating the engagement rate did not immediately come to mind. It was always about posting pretty pictures with quirky captions. But as Instagram's popularity grew it became apparent that placing importance in measuring Instagram Engagement turned out to be a huge advantage. For Instagram’s 2019 projections; the number of active users is estimated to reach 111 million in the United States alone. Currently, Instagram is widely popular among users aged 18 to 29-years old, surpassing the teenage user base of Twitter and Facebook. The gender distribution of active Instagram users worldwide also shows that 14.8 percent are women between the ages of 18 to 24 years-old. It’s no surprise that most fashion brands have chosen to actively promote on the visual-oriented social media platform. How do I measure my Instagram Engagement? When Instagram changes it's algorithm, it does so to increase the relevance of content. 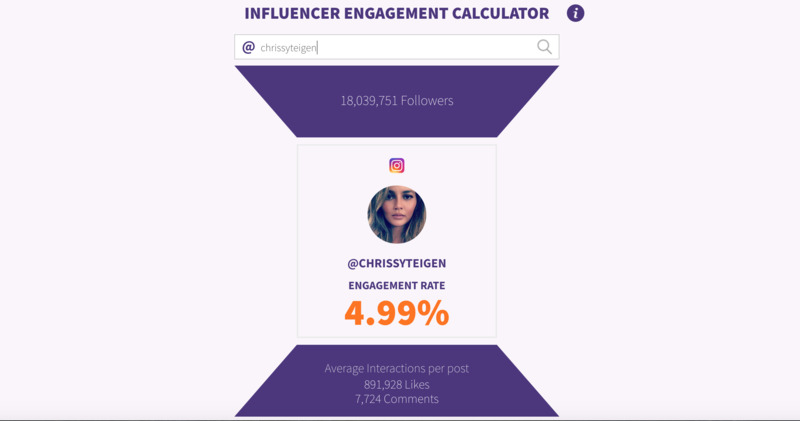 This has driven brands and influencers to measure their Instagram Engagement Rate weekly to ensure their posts are remaining relevant to their audience. Proof of this is the change Instagram introduced to the chronological order of posts that show up on the feed. This change made waves that caused those who depend on Instagram marketing to change their strategies. Since the algorithm change, more and more brands and social media influencers have focused on developing better Instagram engagement practices. In an ideal Instagram marketing world, your engagement rate will constantly be high as your followers grow and your posts reach your expected number of likes. But sadly, that is not always the case. By measuring your engagement rate, you can monitor everything and take the necessary actions to keep your account relevant. 1) Do you have tools to measure your Instagram Engagement Rate? The most obvious point in measuring your actual engagement rate is using a calculator tool. One such tool is the Instagram Engagement Calculator by Phlanx.com which takes the most relevant sample snippet of your following and divides this by comments and likes. You can do this manually but the engagement calculator provides ease for more than 400,000 monthly users thus far! By calculating the number of likes and comments, the Instagram Engagement Calculator can estimate the average engagement rate. Some analytics tools, like what Phlanx offers, are free to use by anyone. 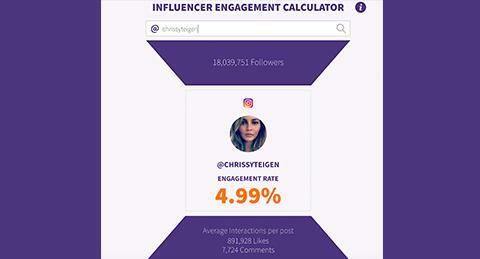 According to Phlanx.com's data reel which studied over 400,000 Instagram profiles entered into the calculator, Chrissy Teigen is one of the most engaging Influencers on Instagram with a whopping 4.99%. Her humourous and relevant content ensures that her audience remains engaged and interested in what she's putting out into the world! 2) Do you produce engagement-worthy Instagram content? Always post shareable content that can spark the interest of your audience. Keep tabs on posts that generate more engagement and compare the rates of Instagram accounts. You can do this through the use of an Instagram Engagement Calculator Manager or by manually checking the number of comments and likes on your posts. Through this, you can determine which post brought positive responses from your followers. You can also check which post increased the awareness of your followers to your brand or account and which one drove the most traffic to your website. 3) Do you find yourself focusing more on the number of your followers above everything else? Instagram engagement is not just about having thousands of followers and brands are finding this irrelevant if the influencer is not influential. It’s a combination of everything— the comments, the replies, the likes, the positive response to your CTAs (call to action), and the number of followers. You cannot measure the success of your engagement rate based on your follower count alone. It is also important to pay equal attention to how you engage and how frequent your engagement is with your followers. At the end of the day, having 1000 thousand followers would not benefit you if your post goes unnoticed. That would be a tell-tale sign that you are engaging your audience less. 4) Do you monitor who your followers are? Getting to know the users behind the numbers can be tiring or even taxing. However, we encourage you to take the time to determine who your followers are. Amplify your engagement to followers who are genuinely interested in your account. Measure the amount of authentic engagement that you are getting from your followers. Stay connected to followers who can help share the word about your account. Prioritize interaction with those who are relevant and valuable. Phlanx.com has recently introduced an Influencer Auditor which audits Instagram accounts and tells you through their special algorithm the "real followers", the amount of authority accounts "influencers" who are following you as well as how many non engaging accounts you have following you. 5) Do you take into account the timing of your Instagram posts? Posting content on a pre-determined and strategic schedule can help you measure the maximum potential of your engagement rate. There are certain times that posting during a lull or a busy time may not get you the desired engagement results that you would like to have. Last of all always keep learning! Sponge information in via popular youtubers and look at what other brands and influencers with high engagements on Instagram are doing!